Modern Gardener: 2007 Perennial Of The Year "Nepeta ‘Walker’s Low"
2007 Perennial Of The Year "Nepeta ‘Walker’s Low"
The Perennial Plant Association has awarded the title of Perennial Plant of the Year to Nepeta ‘Walker’s Low’. Introduced in 1988 in Europe, Walker’s Low catmint has become increasingly popular with each passing year due to its lovely blue-violet flowers and its long bloom time, attractive grey-green foliage, ease of propagation, lack of pest or disease problems, and low maintenance requirements. Size - 30 to 36 inches tall and wide. Uses - Good companion plant for early and late blooming plants. 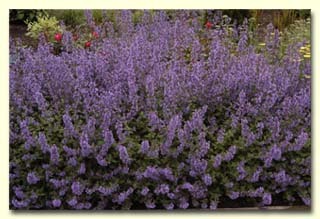 Great for perennial borders, but can be used in herb gardens, rock gardens, as a ground cover, or as a container plant. Unique Qualities - Will bloom continuously throughout the season if properly pruned. Great for attracting bees, butterflies and other pollinating insects, but is deer and rabbit resistant. Leaves release a wonderful aroma when crushed.